As we have now come full circle and we’ve reached out to just about every alldayer, weekender, or Popfest that we possibly could think of, this will be our last in the Popfest Previews series. We’re very happy to be able to include Going Up The Country! If you’ve been at any major Popfest or festival in the UK in the last year, you’ve likely met Christie the Bear and her compassionate companions, Kevin and Linda. Christie accompanies Kev and Linda to various events, indiepop or otherwise, to help raise awareness and donations for Macmillan Cancer Support. Kev and Linda also happen to be the organizers behind Going Up The Country. 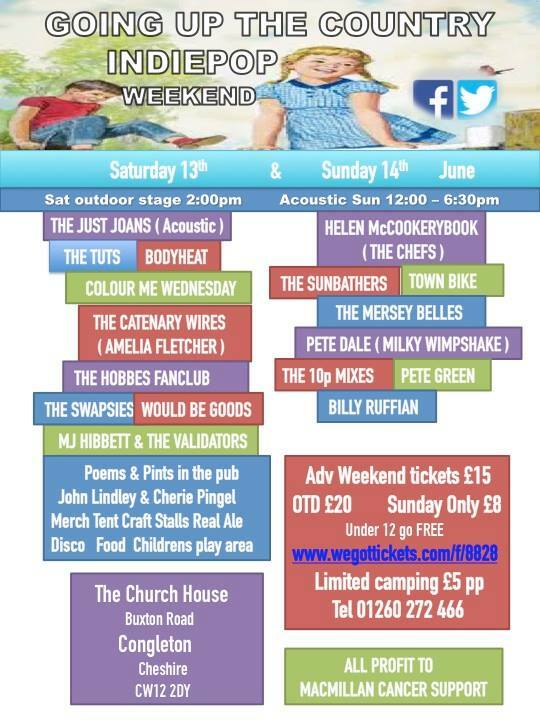 GUTC is what Kev and Linda call a “charity indiepop mini weekender.” Taking place each year at The Church in Congleton, this year’s charity pop weekender is being held on the 13th and 14th of June with bands such as The Swapsies, The Mersey Belles, Bodyheat, and many more! Can you give us a history of Going Up The Country (dates, previous organizers involved, etc.)? How and why did you come to be involved? The inspiration came from Bentley Cooke of Manchester-based band Help Stamp Out Loneliness back in 2011. At a gig he made a throw-away comment about wanting to play somewhere in the countryside. That weekend we were guest DJs at a Charity Scooter event at The Church House, our local pub. They had bands playing on a truck outside and we thought ‘Could we put something on here?’ Bentley loved the idea so, in memory of his mum, he chose Christies, the world famous Cancer Hospital, as the Charity and Going Up The Country was born. This year will be our 4th. Previously, it’s just been one day but we’ve added a totally acoustic Sunday this year. We aspired to give it a mini-Indietracks feel, our favourite festival in all the world … I hope we’ve succeeded! What is the process of choosing bands like? Do you contact them or do they have to apply to play? Are there any rules as to who can or cannot play? Having never done anything like this before, the process was a bit scary! Kev approached bands that we’d seen and enjoyed, so pretty soon we had our first great line up. Disaster struck when Help Stamp Out Loneliness split up (please get back together!). Luckily, The School stepped in as a replacement so our first stab at promoting an event was a great success. As GUTC has become more known, bands now approach us to play too, so if we have space and they have the right Indiepop feel, then they’ll be considered. What has experience taught you when it comes to organizing the event? Don’t have flyers printed too soon. It pays to have someone calm and laid back on the team (Kev) to counteract the one who panics and worries (Linda). Help from friends like Jamie Harrison and Pete & Jo Dale have been invaluable. When does organization start? Is there a timeline you follow? How soon after the festival ends do you begin to plan the next one? At the end of the very long day you think do we want to do this all over again? Then you wake up and remember just how much fun it was, add in the wonderful feedback and the answer is a resounding YES. Planning is mainly booking the bands so it’s pretty much straight after. If we see any and think ‘WOW we’d love them to play Going Up The Country,’ we usually ask them there and then. Do you have any inside tips for attendees? Congleton is pretty sleepy in comparison to Manchester but it is accessible by train and a fair amount goes on musically and artistically. Cheshire is a beautiful part of the world, so come along and have a pint or two of our real ale Pristine Christine, see some excellent musicians, dance your socks off and, to quote one of the best tweets we ever had, have “the most fun ever in a pub car park.” We finish off with an Indiepop Disco in the pub … the locals just love watching everyone bouncing around and think Pristine Christine is made of cherries …. What are some of the best and worst GUTC moments you can remember? As always, all profits from the weekend festivities will be donated to Macmillan Cancer Support, so why not feel good about watching some of your favorite pop bands? Tickets for the weekender are now on sale. Visit the GUTC Facebook group for more info on the lineup and where to purchase your ticket. This entry was posted in march april & may and tagged going up the country, popfest, popfest preview, zine. Bookmark the permalink.